This Saturday, November 24, 2018 will be a special day in Arva as the local credit union holds its official opening in a brand new state of the art building that once housed the local Ulster Bank branch. North Longford & Arva Credit Union was established in 1987 under the direction of the late Fr James McKeon and opened to the public on March 1 in the ‘98 Memorial Hall, Ballinamuck. And as the old adage goes, ‘From little seeds do acorns grow’ and so on November 1, 1987 the Credit Union opened up in the community hall in Arva. “On March 4, 1989 we opened an office in Drumlish and that opens on Friday and Saturday evenings,” said Manager Eileen Byrne, before pointing out that it was this move that resulted in the new name ‘North Longford & Arva Credit Union’ being established. Meanwhile, staff at the local credit union say it provides a great service to the people of the community. North Longford & Arva Credit Union also owns the premises’ in Arva and in Drumlish, and its new home in the heart of the town of Arva is steeped in economic tradition and history. An historic building in it own right, the building has served as a financial institution for many years now in a town that will be forever regarded as a market town. Ideally located for business, Arva is the Cavan town where the tree provinces meet and attracts people from all over Ireland to its shores with the annual 3 Province Breffni Challenge and the very popular agricultural show. The building, meanwhile, has been renovated and refurbished and is a bright, spacious and warm space in which locals can chat about their finances and find solutions to any difficulties that may have arisen. 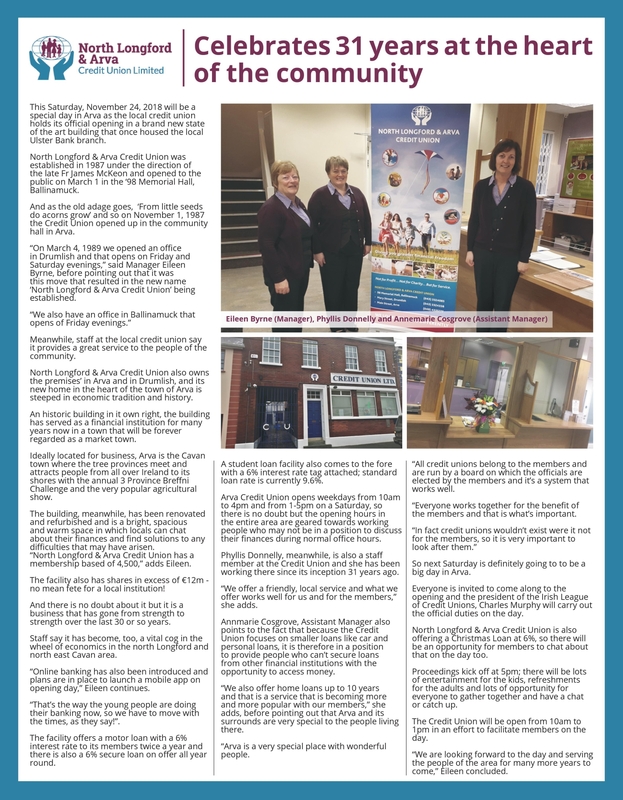 “North Longford & Arva Credit Union has a membership based of 4,500,” adds Eileen. The facility also has shares in excess of €12m - no mean fete for a local institution! And there is no doubt about it but it is a business that has gone from strength to strength over the last 30 or so years. Staff say it has become, too, a vital cog in the wheel of economics in the north Longford and north east Cavan area. “Online banking has also been introduced and plans are in place to launch a mobile app on opening day,” Eileen continues. “That’s the way the young people are doing their banking now, so we have to move with the times, as they say!”. The facility offers a motor loan with a 6% interest rate to its members twice a year and there is also a 6% secure loan on offer all year round. A student loan facility also comes to the fore with a 6% interest rate tag attached; standard loan rate is currently 9.6%. Arva Credit Union opens weekdays from 10am to 4pm and from 1-5pm on a Saturday, so there is no doubt but the opening hours in the entire area are geared towards working people who may not be in a position to discuss their finances during normal office hours. Phyllis Donnelly, meanwhile, is also a staff member at the Credit Union and she has been working there since its inception 31 years ago. “We offer a friendly, local service and what we offer works well for us and for the members,” she adds. Annmarie Cosgrove, Assistant Manager also points to the fact that because the Credit Union focuses on smaller loans like car and personal loans, it is therefore in a position to provide people who can’t secure loans from other financial institutions with the opportunity to access money. “We also offer home loans up to 10 years and that is a service that is becoming more and more popular with our members,” she adds, before pointing out that Arva and its surrounds are very special to the people living there. “Arva is a very special place with wonderful people. “All credit unions belong to the members and are run by a board on which the officials are elected by the members and it’s a system that works well. “Everyone works together for the benefit of the members and that is what’s important. So next Saturday is definitely going to to be a big day in Arva. Everyone is invited to come along to the opening and the president of the Irish League of Credit Unions, Charles Murphy will carry out the official duties on the day. North Longford & Arva Credit Union is also offering a Christmas Loan at 6%, so there will be an opportunity for members to chat about that on the day too. Proceedings kick off at 5pm; there will be lots of entertainment for the kids, refreshments for the adults and lots of opportunity for everyone to gather together and have a chat or catch up. The Credit Union will be open from 10am to 1pm in an effort to facilitate members on the day. “We are looking forward to the day and serving the people of the area for many more years to come,” Eileen concluded.